In honor of Ada Lovelace Day last March, Artist Sydney Padua created a comic featuring the mostly-true-except-for-the-inaccurate-bits story of Ada Lovelace's childhood, education, and her fateful meeting with Charles Babbage which ultimately lead to their crime-fighting partnership (I mentioned the inaccurate bits, right?). 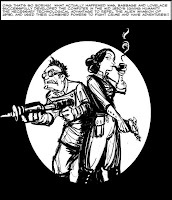 It's steampunk, it's geeky, and it's got copious explanatory notes - what more does a comic need? Lovelace and Babbage vs. The Client (currently in progress). The real Ada Lovelace began her life-long friendship Cambridge mathematics professor Charles Babbage when she was just 17 years old. The two corresponded on mathematics, logic and other topics, and, in the process of writing a description of Babbage's proposed "Analytical Engine" created the very first computer program. Ada married William King at the age of 19, had three children, and sadly died of cancer in 1852 at the age of 37. As far as we know, she and Babbage had no crime-fighting adventures , but it's fun to consider what could have been. hah, very cool - thanks for sharing!